The Rough Creek watershed, formerly the water supply area for the Town of Canton, NC, is now a city owned, 870 acre park open to recreation including hiking and mountain biking. 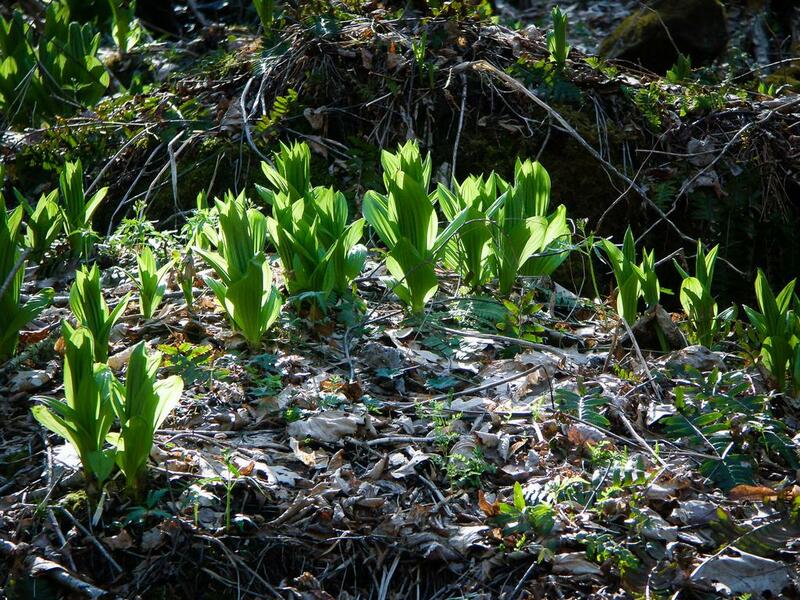 False Hellebore emerges from the forest floor with its distinctive shape into a spear of sunlight beside the main trail in Rough Creek Watershed. Views like this across the adjoining pastures are common along the upper part of the Cherry Cove trail. As a hanging valley of sorts, the Rough Creek watershed sits in an elongated bowl at the south end of the Newfound Mountain complex north of town. 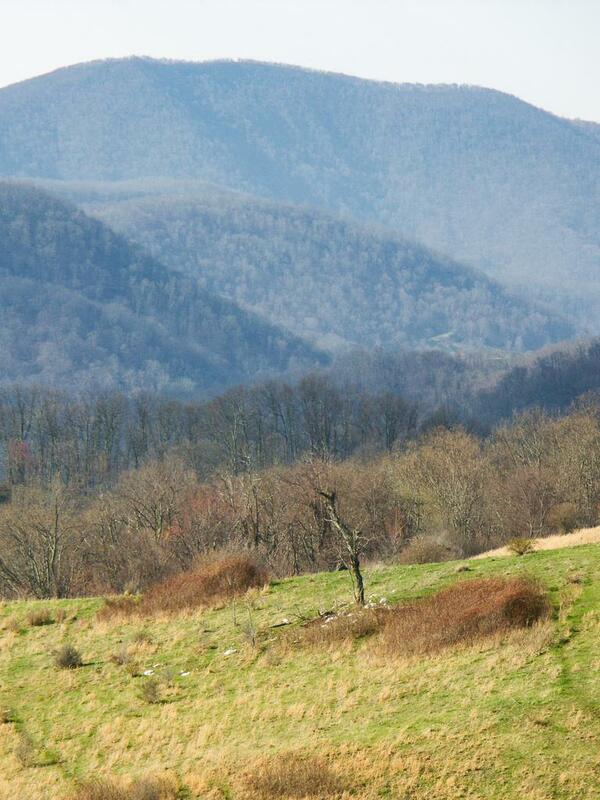 Elevations range from around 3000 ft. at the entrance gate in the valley to over 4500 ft. on Glade Mountain. Rough Creek is the main stream which drains the valley, and it splits into at least 4 main tributaries inside the park's boundaries. Rough Creek is known for its outstanding water quality, which is good since it was used for a public drinking water supply. A series of old, gated roads and purpose-built trails winds around the valley. From the parking area, you'll climb into the main part of the valley via a steep old road. After climbing to about 3600 ft. elevation alongside the stream, the road levels out some and reaches a junction. Both directions, left and right, are open to hiking, and you can hike a loop along the perimeter of the watershed (the "outer" loop) across the top of Glade Mountain by using them. Another old road cuts across the middle of the outer loop at a lower elevation, making a shorter "inner" loop you can hike as well. The Cherry Cove trail splits off the "inner" loop road and climbs to the "outer" loop perimeter road on the west side of the watershed via switchbacks. It then follows the "outer" loop road for a short bit along the ridge (with magnificent views), splits off again and descends through the lower portion of The Glades, before climbing the eastern edge of the watershed to again reach the "outer" perimeter loop road. 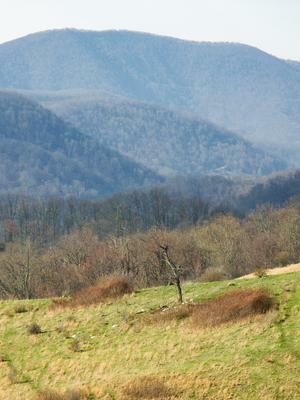 At the top of the Cherry Cove trail, in the Rough Creek watershed, this view opens up across the adjacent pastures of the mountains to the southwest. The Turkey Run trail splits off the "inner" loop road and joins back with it again at a point farther east, making yet another "inner" loop of trail. A nice figure 8 hike can incorporate many of these roads and trails into one long, 10+ mile hike. Pisgah Map Company has made the excellent Rough Creek Watershed Map (1.8MB PDF), distributed free by the Town of Canton for download and printing. That PDF is also usable in the Avenza PDF Maps application for iOS and Android. You can also find another version of this map containing some additional sidebar information directly within the Avenza app by searching for "Rough Creek Watershed" in the Map Store. Aside from a sign board at the parking area, there are no developed amenities in the Rough Creek watershed. No motorized vehicles on the trails. No horses. Hiking and mountain biking only. No camping or open flames. No firearms, hunting, or fishing. NO pets are allowed (even leashed). No picking flowers or plants. Rough Creek is primarily used by locals, but if you're visiting WNC from out of state or the East, it makes a good addition to your trip as well. Rough Creek Watershed is a day-use only area. No camping is allowed within the valley. Nearby private campgrounds can be found in Haywood County from Canton to Waynesville and into the Pisgah National Forest beyond. It's worth a drive from Pisgah if you're camping there and looking to add a little variety to your trip. Numerous lodging options are available in the nearby cities and towns of Asheville, Canton, Clyde, and Waynesville, NC, within a 30 minute drive of the trailhead. Take I-40 west to exit 33 for Newfound Road. At the end of the ramp, go straight across Newfound Road onto Freedom Drive and go 0.9 mi. Turn right onto Beaverdam Road (SR 1613) and go 1.9 mi. Turn left onto Rice Cove Road (SR 1616) and go 0.4 mi. Turn right onto Rough Water Point (SR 1617) and go to the end in about 0.3 mile. On the left is a gate with a cattle guard; you need to open the gate, drive through, and close the gate again behind you. It's 0.3 miles to the parking area in the wide spot of the road on the left. Take Newfound Road across I-40 and turn elft on Freedom Drive. Follow the same directons as above.